Then: Parts of the church were rebuilt in the 1840s. The adjoining church building was in use as a school in the 19th century. Now: A stained glass window commemorates the Rev. Wilbert Awdry, author of the Thomas the Tank engine books. 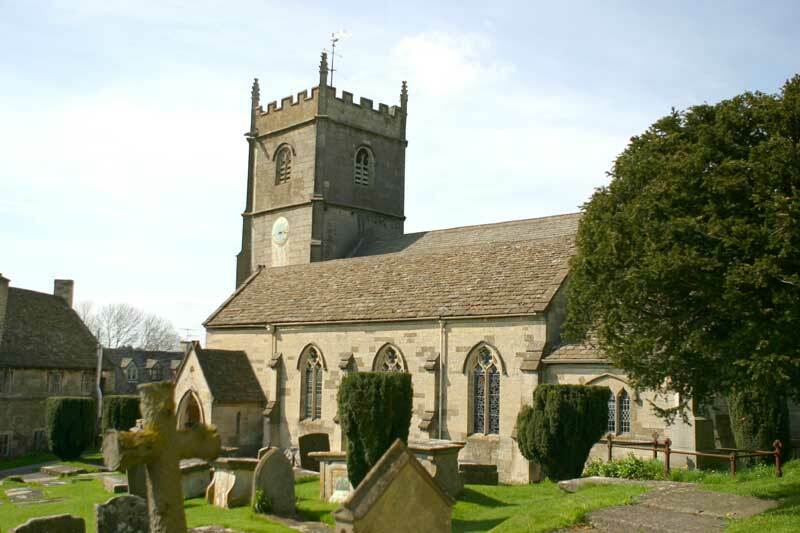 The first record of a church in Rodborough dates from 1384, when it was a chapelry of Minchinhampton. The oldest part of the present building, dedicated to St. Mary Magdalene, is the tower, which was built in the early 16th century. The rest of the church was rebuilt in a convincing Gothic style in 1841-43 by Thomas Foster & Son, and in 1895, Waller & Son of Gloucester rebuilt the chancel and extended the north and south aisles to flank it. In the churchyard is the Apperly Mausoleum of c.1915 (probably designed by P.R. Morley Horder), built to commemorate members of the Apperly family of Dudbridge and Rodborough Court. Inside the church is a modern stained glass window of 1998, commemorating Rev. Wilbert Awdry, author of the Thomas the Tank Engine books, who lived here. The adjoining Endowed School building was originally the Church House, and dates from before 1700. It was adapted for use as a school in 1820, but closed after Rodborough County Primary School opened in 1901. It is now used for local meetings. The Old Rectory, a little way east along Walkley Hill, was converted in 1805, from some 17th century weavers' cottages, and adapted as a parsonage in 1842-43. In 1909, The Prince Albert Inn at the top of the hill was built in a simple Tudor style by P.R. Morley-Horder for Stroud Brewery. © 2016 Digital Stroud. Please read our Disclaimer.